Today’s subject is near and dear……. to the REAR. Why? Because today we’re talkin’ Toilets. Other than Dorothy’s little dog in the Wizard of Oz, you may not have heard of TOTO. However, your water closet education begins here with one of the top quality manufactures of toilets in the world. TOTO is a highly respected Japanese toilet manufacturer with years of experience in low water designs and attractive styling. To also help you get a great price with a quality merchant, we also work to track that down. Click on any of the highlighted product names to see your discounted price today! The TOTO Eco Supreme model #MS864114E #01, is overall, one of the very best toilets on the market currently. Why has this one model ranked high enough to qualify as a GreatStuffThatWorks product? Here’s why. Not only have three of my plumbing experts, Master plumber Mitch Shair, Douglas Lavelle and senior plumbing sales professional Kathi Abacherli, ranked this a top choice, but after 1.5 years of my own, in home, bottom tested use by both males and females, it has all the benefits, performance and human engineering qualities that make it great to live with everyday. This TOTO is a one piece, low profile, all porcelain design with an elongated bowel that gives it a contemporary style. It also incorporates their patented G-Max™ flushing system, a powerful way to flush without using much water. Some of the technical things your plumber or you will need to care about are that The Eco Supreme MS864114E, has a 12″ offset from the wall. This is the distance from the wall to the center of the toilet drain. Since moving a drain already in the floor is not usually easy, the odds are high this toilet will fit into most standard plumbing configurations. For all of us concerned with our planet, it is also being registered to carry the EPA’s High Efficiency Toilet WaterSense© label. Many of TOTO’s new models will earn you one point in the LEED US Green Building Standards rating system. One of the great features of this TOTO model MS864114E is that it only uses 1.28 gallons per flush (GPF). For reference, a standard toilet today commonly has a GPF of 1.6. Older toilets can be as high as 3.5-4 GPF! So, replacing a frequently used old toilet with one of these at 1.28 GPF could save you from using as much as 7,900 gallons Per Year. The math on this is simple at an average of 6-8 flushes per day. Amazing, isn’t it? Good news also for your water bill or septic system. Some low water toilets choose to use noisy, high pressure to flush, but this marvel flushes unassisted, quickly, quietly and completely. An alternate design in conventional toilet systems is called “dual flush.” It allows you to choose from two flush water amounts, depending upon what you’ve just deposited. This can potentially save you even more water, but there are a few things to consider with this innovative design. Being a relatively new design, it is difficult to know about their long term reliability. Since each manufacturer appears to have created their own special design for this dual system, finding parts 5-10 years down the road for that special, no longer made, design may be more difficult. That said, the “pee” flush usually uses only .75 GPF vs a “poop” flush of 1.28 or higher on most models. Since we tend to pee more than we poop, over time the water use can add up. I am researching the dual flush designs to see if there are models that meet the GSTW standards of superior benefits, performance and human engineering and will report back. However, this TOTO MS864114E single flush, very low water use toilet, also incorporates features you would likely never know about until you lived with it. Some lessor quality designs use plastic in the internal water channel vs a full porcelain design, either to cut costs or to allow adjustability from the wall. A drawback to this design is significant water noise during every flush. Even if you have an all porcelain design, the completeness and quality of the glazing is critical to long term performance. 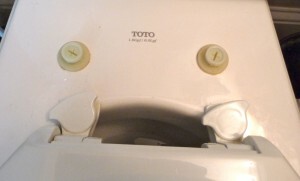 TOTO not only computer designed and perfected a unique internal bowel design to assure a complete flush, but also baked in a durable, super smooth glaze finish throughout the toilet, and specifically within every inch of the water channel, were you would never see. Lower quality toilets often leave rough surfaces in the internal places you can’t see to save money and manufacturing time. One of my experts told me before he installs a customer supplied toilet he runs his hand up into the dry, clean water channel and feels for roughness. If its rough, he asks the customer to pick another toilet. He knows it will only be a source of long term aggravation. This is because the rough areas in the channel begin to collect debris over time, slowly choking off the water flow and reducing the velocity of every flush. Your toilet plunger soon becomes your trusty toilet sentry. Bottom line, this TOTO G-Max™ model flushes everything it’s designed to flush, 99% of the time, First Flush. Only once in this last year and a half of daily use did we have to make a toilet brush adjustment and re-flush. We have never had to plunger the bowel. First Flush is all that counts. 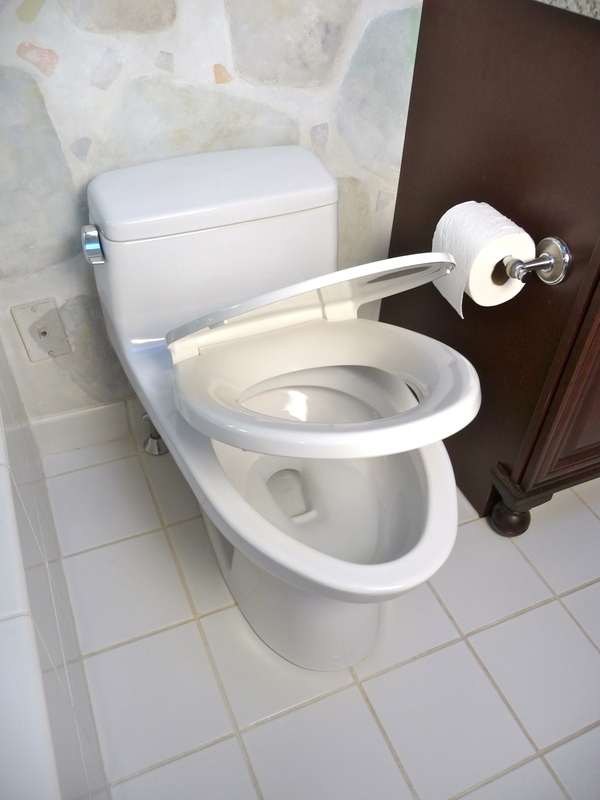 A low GPF toilet has no value if it requires two or three flushes or sends you running for the plunger. Disclosure: We did not test toys, stuffed animals or other non-human byproducts. This TOTO also comes in several colors to make coordinating it with your color scheme easier. Remember to Click on any of the highlighted product names to see your discounted price today! And now a Bonus Feature! Topping (or I should say “Lidding”) off their superior design is an equally superior toilet seat design referred to as a damped or “Soft Close” design. The design finally brings to an end the dropped lid sonic boom by slowly, quietly closing both seat and lid, once set into motion! This TOTO model MS864114E comes with this seat as part of the package. So, no running out to the “depot” to get a new seat when you change the toilet. Guys are so fascinated watching the seat and cover slowly close, that the 2:00 am, sleepy lady splash could be a thing of the past! The TOTO UltraMax II MS604114CEFRG with the option for specifying Left Hand or Right Hand flush lever location. The TOTO Carlyle II MS614114CEF with decorative side skirting (at a premium cost). 1.) If you have a “back to back” plumbing installation, meaning you have two bathrooms that are on opposite sides of the same wall, Ask Your Plumber if you are able to use a low flush toilet on both sides. Because of the draw the lower water toilets create, some “back to back” on the same vent stack installations have been known to pull the water from the opposite toilet when the other is flushed. 2.) Another option in toilet design is side skirting, a cosmetic design that covers the water channel bend moulded into the porcelain base. If you want an even more designer look, it’s an upgrade to consider. 3.) 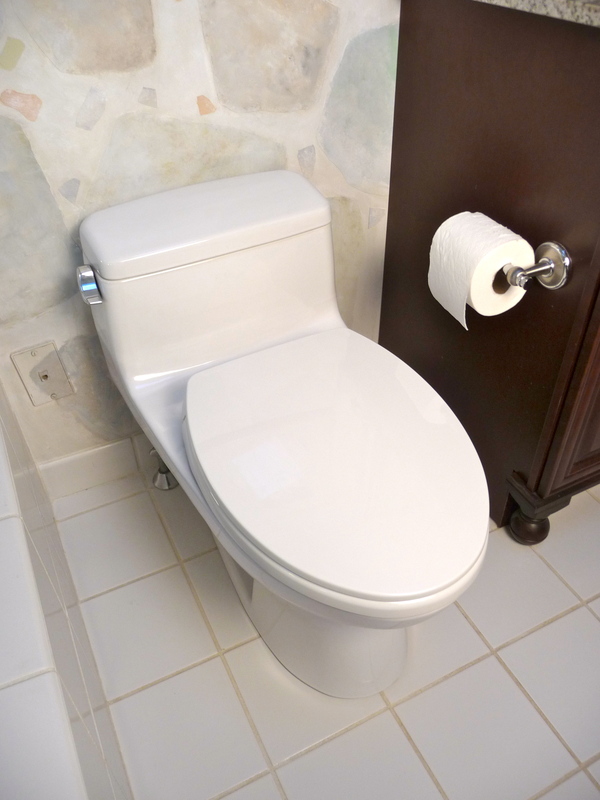 Once you live with a Quiet Close toilet seat, you’re likely to change your other toilet seats soon after. I came home one day and my wife had “upgraded” our other two seats to the BEMIS seat listed below. BEMIS, a quality toilet seat manufacturer, makes a GSTW qualified seat that has the best combination of benefits, performance and human engineering we’ve found in this type of product. Their “WhisperClose with Easy Clean & Change and Tight Grip” seat not only closes quietly, but its EasyClean & Change feature makes everyday cleaning around the hinge side of the seat fast and simple. The seat installs using two large plastic bolts that fit through the holes in the porcelain base. Bemis now includes the Tight Grip plastic bolts that automatically break off the excess thread when the bolts are at the proper tightness. This means the toilet seat is always installed to the proper tightness and shouldn’t loosen up on you. The head of these bolts above the rim are round with a groove below the top of the head. The hinge side of the seat has two slide locks that move from a left (open) position to a center (closed) position. To complete the install, simply position the hinge locks in the open position over the bolt heads installed in the base. Press down to snap in place and move the side locks to the center locked position. Done. Now, anytime you want to clean the hinge area grime, simply slide both locks to the left (open) position and gently pull up on the rear of the seat. The seat completely removes for cleaning. Nice. A Round style (Bemis 200SLOWT) or Elongated style (Bemis 1200SLOWT), depending upon your bowl shape. The links above will automatically take you to the correct version you choose. Remember, we always work to find you a quality merchant with a competitive price. Click on any of the highlighted product names to see what your discount is today! And that’s a wrap on the crapper! Quality design, low water use, great flushing toilets and friendly toilet seats that don’t go boom in the night. Now you’re living the good life! Just a question for the expert: We don’t need a toilet but I like the sound (or absence of sound) of that toilet seat. We have a regular, not elongated Toto toilet. Is there a seat for us, too? Anisa, the finest (toilet) seat in the house is waiting for you! I just updated the Toto Toilet Extraordinaire! review with the model numbers for both the Bemis Round front and Elongated front types. You can read the details about each there, but this seat is quiet, easy to clean around and should stay tight for years with their new Tight Grip system. The Toilet Seat info and links are near the end of the review and, as always, we tracked down a quality merchant that has a great price. The links will take you there. So, now that I’m ready, should I get the Bemis seat, not the Tot seat for my tot toilet? In general, WordPress will offer the most search engine friendly platform, as it was designed from the core to be search friendly. There is a wide variety of WordPress themes available and most can be set up to have your own unique look. My theme is specialized, but any skilled WordPress tech can layout most features you will likely want using one of the more standard “built for business” themes. To save yourself money and multiple reworks, its best to find the websites in your market you like the best and capture images of those as a reference before you work with your tech. This will help make the most of the money you spend with them and produce faster results you are in sync with. I worked with an experienced tech to design the layout to be very uncluttered and simple to navigate. Many have commented they enjoy that straightforward simplicity and we will continue to work to retain that feeling as we add more content options.